Barcelona's comeback vs. PSG, the greatest in Champions League history, defies all logical reason and comes at point of inflection for the club. There is a theory in football, much propagated after Sir Alex Ferguson’s first–aborted–retirement, that managers should never let players know when they’re leaving because to do so makes them lame ducks. Why would a player listen, why would he follow an awkward instruction, if he knows his boss will be gone in two months anyway? Tell that to Luis Enrique. There had been rumblings at Barcelona for much of the season. There are always rumblings at Barcelona, perhaps the most political club in the world, but these were louder than normal: worries about the direction the club was taking, worries about recruitment, worries about the lack of Catalans in the side, worries about a lack of intensity, worries about the seeming disconnect between the vaunted front line of Neymar, Luis Suarez and Lionel Messi and the rest of the team. None of the gripes were without substance, but Luis Enrique was entitled to wonder whether, after winning two doubles in his first two season, plus a Champions League title, he might not be afforded a little respite. Little wonder he has spoken of his weariness. Matters came to a head three weeks ago, as Barcelona was hammered 4-0 by Paris Saint-Germain, a game in which it was outplayed from start to finish, out-pressed and out-passed. The cycle was ending, pundits concluded, reasonably enough: key players were aging, new players weren’t good enough. A desultory 2-1 win over Leganes the following Saturday, with a record low of one Catalan on the pitch–and that being Sergi Roberto, who had been woeful in Paris–only seemed to confirm the malaise. But then Barcelona won 2-1 away at Atletico Madrid, while Real Madrid began to look vulnerable. Barcelona hammered Sporting Gijon 6-1 and Luis Enrique announced he was leaving. Later that night, Real Madrid drew at home to Las Palmas and Barcelona found itself top of the table. It’s true it has played a game more than Madrid, but with a Clasico to come, its destiny is in its own hands. Just as in January of Luis Enrique’s first season, when all seemed lost, momentum has come from nowhere. Then, as the front three worked out a way of playing together, it carried the club to the treble. It could happen again–without any of those background issues being resolved. Celta Vigo was then dispatched 5-0, making it two five-goal victories in a row. A third, surely, was too much to ask. But what happened at Camp Nou on Wednesday will live in the memory as long as football is played. It was a series Barcelona lost twice and yet still won, a gloriously inexplicable night, the comeback completed by Sergi Roberto with the third of three goals in the final seven minutes. It was the sort of result that will make a team believe it can never lose, that this season is powered by some form of destiny. Faith, certainly, is a better explanation than anything connected to reason. Barcelona-based paper Sport gave every Barcelona player a mark of 10/10 on Thursday morning, which was an understandable response but not an accurate one. It seems extraordinary to say it, but Barcelona wasn’t actually that good on the night. The first two goals game from PSG panicking when faced with a strangely bouncing ball in the box. Two of the goals were from penalties, one unfortunately conceded when Thomas Meunier fell into the path of Neymar, the other given after a dive from Luis Suarez. The other two stemmed from free kicks–one arrowed into the top corner by Neymar, the other half-cleared then lifted over PSG’s shambolic back line. This was not fluent Barcelona, passing its opponent to death in flurry after flurry of brilliance; it was relentless and remorseless, but it won largely because PSG collapsed mentally–so much so that in those seven minutes after Barcelona’s fourth goal, it completed just four passes. This was the confluence of two trends. Firstly, that of PSG’s lack of self-belief. The 10-man away goals success over Chelsea in 2015 hinted at a change, but essentially PSG loses against the first decent side it faces in a decisive game in the Champions League. The sense of nervousness was there from the start on Wednesday. It’s easy to say in retrospect, of course, but perhaps it would have been easier psychologically for PSG to press Barcelona as it had in the first leg and as it tried to do in the second half, rather than sitting back. Unai Emery, perhaps, will be blamed for that (and having won just two of 24 games against Barcelona, he perhaps has his own demons in that regard) but PSG had won 14 of 16 games before Wednesday, drawing the other two, and there was a real sense his ideas had taken root. 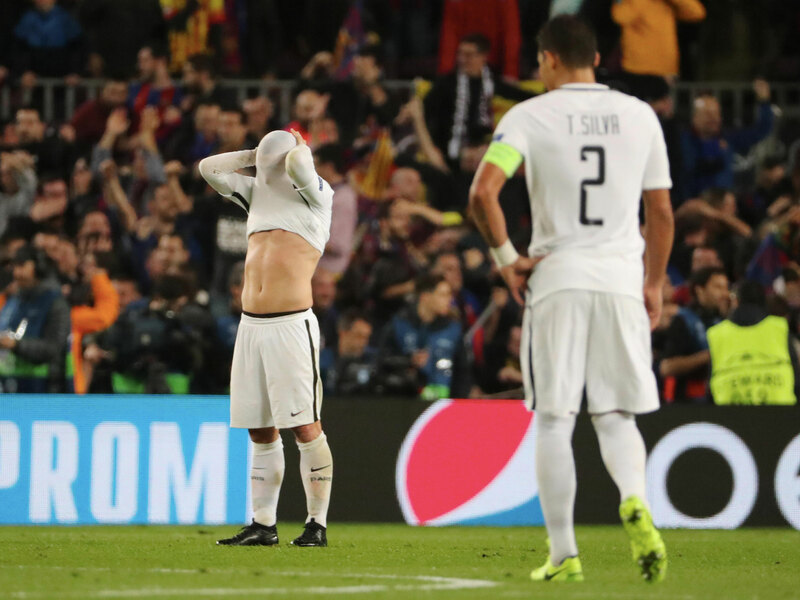 Amid the confusion, it would be folly to overlook the act that the only reason it was such a crushing disappointment was that PSG had been so good in the first leg. The second is that of big scores in the later stages of the Champions League, which are becoming increasingly frequent. It’s not just games like Real Madrid beating Schalke 6-1 in 2014 or Bayern Munich putting seven past Shakhtar and six past Porto in 2015, when the disparity of resources is obvious. It’s the biggest sides occasionally suffering crushing defeats: Real Madrid beating Bayern 4-0 in 2014, Borussia Dortmund beating Madrid 4-1 and Bayern beating Barcelona 3-0 and 4-0 in 2013; even Arsenal’s two 5-1 defeats to Bayern this season or Barcelona’s defeat in the first leg. These are not historically normal scores. That, too, seems an issue of a concentration of resources at a handful of clubs. Attacks have probably never been better, but the big clubs, used to dominating their domestic league, become so used to attacking that they lose the capacity to defend when they meet a side of similar or greater status. The result is big margins and so the capacity for turnarounds such as that seen on Wednesday. Not that the knowledge it is part of a historical trend will do much to soothe PSG. Pressure will come on Emery, inevitably, while Barcelona has a renewed sense of momentum. Luis Enrique could leave at the end of this season having won eight of the nine major trophies he’s contested–and many would still doubt just how good a coach he really is.